No fairy princess is complete without her halo and wand. 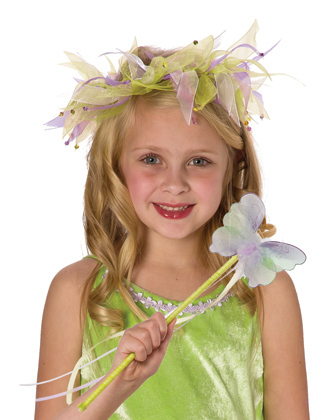 This green and purple ribbon halo and butterfly wand set made of flowing streamers and glittering gems are the perfect addition. The halo sits atop the head with a flexible plastic headband, and the wand has a thick, durable handle. It coordinate beautifully with our adorable fairy dress ups. WARNING: Choking Hazard: Small Parts. Not for children under 3 yrs. This looked fabulous with my daughter's Tinkerbell costume! Very well made and will last for a long time to come!